**This Lunar Love Note came through a dream I had on the eve of this Full Moon, the response to a question I had asked before sleeping: How did Gemini, this cosmic archetypal Messenger, want to express itself and what are we to release? Below is the message I received, written in italics. This is a departure for me in how I write, but I trust in the process–I asked what to share and this is what I received. The Gemini Full Moon is here and you have something to share, I know. Of course you do, the archetype of the Communicator, the Messenger, the Storyteller, the Entertainer. Clearly the outer world is showing us that things must change and sometimes it’s hard to know what the next wise steps are in our ascension. It seems we’re smarter than ever—in some ways. But all this learning and technology do not seem to be bringing peace to our hearts and certainly not to this planet. We apologize for having worked the left brain so hard. We are the Revolutionaries and the Gamechangers, the Lovers and the Lightworkers, so we will always be driven to be more and learn more. Reason and logic of the masculine took over and we are making every effort to access the feminine right brain too. You might have noticed as we have intensified our ability to feel our emotions and express our compassion along with accessing and receiving the intuitive, multidimensional messages of the feminine brain. We want to know how to serve and to serve well, to love and to love well, to lead and to lead well. So many of us are hungry to know a different way to be in this world. Sometimes our heads are so wired with thoughts that we can’t sleep, filled with confusion and frightful images that cloud our vision of the next steps to take. Stop now, please, and listen child. The Divine Mind whispers: Call in your Creative Muse, your inspiration for the new story. She is in the quiet space of your Heart where you’ll hear the steady beat of your deepest desires revealed in the new plot. But many of you do not allow yourself enough time and space to know Her, to be in conversation, to reflect and daydream, to contemplate those larger questions about your bigger dreams and to deeply listen to the messages there to guide you. If you only knew what would change in your world if you connected to your Muse every day, committing your energy to a process of creating what it is your soul seeks to experience in this lifetime, you would remember your purpose here and who you are as a Creator. The density of this world has made you forget you are all Master Channellers in this regard. It is time to unburden yourself of all the chains, speak less and listen more, heart to heart, lay down the excuses and assume 100% responsibility for all your creations. The Gemini part of your soul seeks to be set free and witnessed in all Her light. Your soul is limitless, boundless, eternal, whole, thereby requiring the freedom to give birth to its continual becoming in this physical reality. And while you have created and may continue to create any obligations, duties, structures and systems of your choosing, you will still search for all the ways of freedom you can experience. And you will say, I want business to be prosperous, this amount of money in the bank, this recognition at work, this person to marry, this house on the beach, my children to be well. The Gemini intent does not judge and is in fact an enthusiastic Witness to your preferences, but we are here to teach you how to go beyond what you know with the small mind that keeps you bound as the small self so that you can and will loosen your attachment to the boundaries of this reality and know who you are and who you have always been as the True Self. You are awakening to greater levels and experiences of power and freedom, but within this awakening you are learning to direct your energies responsibly and to know yourself in a higher way. In waking up to higher states of consciousness, seek balance between keeping one foot on the ground and the other in the realm of Spirit. The Muse sings: Time to open up to the superconscious abilities of the Divine Mind, for it will show you the vision of heaven here on earth where you all thrive, living in unity consciousness, in harmony with all creatures, in an abundance of creativity, love, connection, and radiant well-being. Breathe into your desire and your personal will in expressing the truth of who you are in your unique, perfect expression of the gifts you have come to share with the world. Tap into the magic and the power of your sexual, creative energy that when channeled is a Muse all unto her own. In relationships, you have many potential partners who may join with you in this type of soulful union in which you express your divine sexuality. In this matter, Gemini’s commitment to and understanding of relationships are evolving. 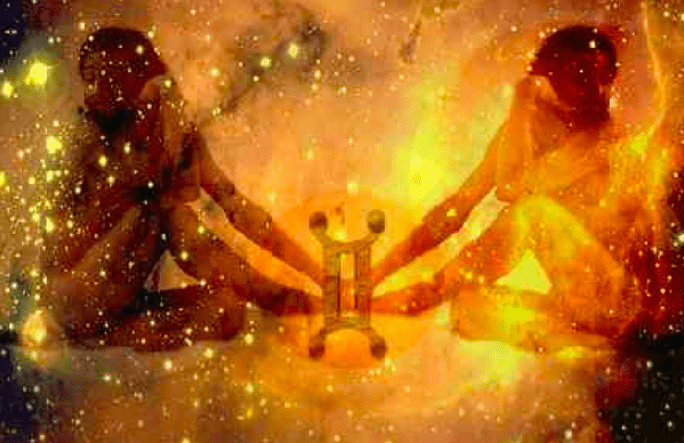 Gemini, the symbol and vibrations of the Twin, denotes the potential of a romantic relationship so powerful and soul-honouring that the person serves as both a perfect catalyst and mirror for your evolution in love and your loving service to our planet. Release the beliefs that you must live in the small mind who serves to protect you from change, cares only of your survival, distracts you with fears and doubts magnified each time you take a step towards your freedom. Know this: the program of fear is to be felt and released. The love in you and on this planet is gaining strength. Spend time each day breathing in the Light that is everywhere, for your soul story will shine as it must. The Shapeshifter steps in: If you decide an old story must live in your retelling of it, then you will continue to give it life and you will learn this way too. Be willing to be transformed by your new dream claimed in the vibration of love, letting yourself be changed in order to activate and express it. Shed the skin. If only you knew the Power of your Spoken Word, you might consider more lovingly your motivations in the words you write and the words you speak whose vibrational signature is eternal. Activate the Divine Messenger within you to teach you how to wield this great power you possess in every thought, word and action as expression of your intent to create love on this planet. May you speak from the heart and tell the truth from a place of true service. May your messages be wise. And our last words to you come from the Entertainer, the Jester, the Trickster, and the Divine Comedian who are everywhere in many different guises, inviting you to lighten up, reminding you that wisdom can also be light, playful, filled with riddles and paradoxes that reveal truth as well. Gemini is close to your inner child and is speaking to him and her right now. Play. Laugh. Delight. Wonder. Be in Awe of the light and the love. Do not lose heart. The dream is real. Ask for the Divine Intelligence with every light-filled breath you take to live it. What are you learning in the relationships you’ve experienced so far? Sign up now to receive information about Love 101 (coming in February 2019), an intuitive astrology online program for Mystical Lovers, designed to enlighten, transform and magnetize to you the Love Story in all the relationships your birth chart shows you were born to live. SIGN UP for the Love Matters email list at the bottom of this page to receive important insights twice a month into how to work with these powerful celestial influences that affect our individual and collective psyche. Sign up & once you’ve confirmed your subscription, you’ll receive my information packed astrology blog “LUNAR LOVE NOTES” plus direct access to my LOVE LETTER blog & other insider monthly features. You’re also immediately entered into a monthly draw for a free LOVE MAP consultation (a $199 value) that provides clarity & guidance in career & relationships. Tap into the magic and the power of your sexual, creative energy that when channelled is a Muse all unto her own. In relationships, you have many potential partners who may join with you in this type of soulful union in which you express your divine sexuality. In this matter, Gemini’s commitment to and understanding of relationships are evolving. This message brought me to tears. Blessings from the bottom of my heart. The Gemini message spoke about the Twin energy more focussed on relationship than polarity/duality that Gemini is known for typically. This is new to me. Are you meaning Twin Flame energy? I was a little surprised myself when that part of the messsage came through, referring to the Twin energy in relationships. The message did not include the word Flame–I would suggest as I do with my clients who believe in Twin Flames to go with what feels True for you. An archetype such as the Twin has many meanings. Great question–one that seems to be coming up a lot lately! I love these letters! Your Scorpio one and now this one. I will tell the new story from love. Period. Thanks, Victoria! The Scorpio New Moon is still working on me–that was a deep one. And YAY about the new love story!! Thank you, Jenn. I needed some hope today. You are so welcome. Me too. Each and every day until I’m in total faith. Words are powerful and I feel as though this is such a beautiful and powerful intention for love and soul growth supported by relationship. I look forward to these each month. They are beautiful and inspiring. They create longing in me to dive deeper and understand. Thank you for sharing your gifts. Thank you so much Regina. That means a lot. I do love sharing this love I have for astrogly, the archetypes and the moon here in this blog with you. Thank you, Jenn!! This is so powerful. I read it multiple times under the light of the full moon. DEEPLY received.